Our B&B is situated just a short drive (10 minutes) from the Cliffs of Moher. The cliffs take their name from an old fort called Moher that once stood on Hag’s Head, the southernmost point of the cliffs. The writer Thomas Johnson Westropp referred to it in 1905 asMoher Uí Ruis or Moher Uí Ruidhin. The fort still stood in 1780 and is mentioned in an account from John Lloyd’s a Short Tour Of Clare (1780). It was demolished in 1808 to provide material for a new telegraph tower. The present tower near the site of the old Moher Uí Ruidhin was built as a lookout tower during the Napoleonic wars, not too far from out B&B. 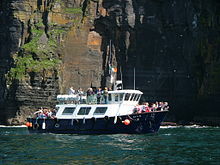 Ferry trips which depart just down the road at Doolin Pier, will allow you to view the cliffs from sea level, if you would prefer your feet firmly planted on solid ground they are just a 3min drive away.